Morning folks. Here is one of my favourite comics. From its unintentional racism, to its false dichotomy (evolution instead of Jesus, as if one precludes the other), this comic is firing on all cylinders. 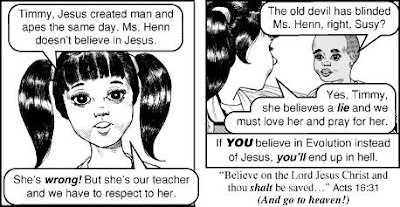 It was penned by Jack Chick of the infamous Chick Publications, who has been creating hate-filled ultra-fundamentalist tracts since the 1960s. This particular one is copyright 2004. You can buy these tracts on their website for 16 cents a piece, if you want to make an interesting collection. Chick has been widely criticized by Catholics and Protestants alike, but his 200+ different tracts have been published in 100 languages and have been widely disseminated. I think this comic will speak for itself about Chick's extreme fundamentalist beliefs, and how he views evolutionists (hint: they are very angry and argumentative). Look for a shout-out to Dr. Kent Hovind, the Young Earth Creationist I saw speak when I was only a lad, and who is now serving serious jail time for tax evasion. What is so sad to me is the mixture of real Christian beliefs with outright lunacy; the one taints the other. It certainly shows why Rob Bell felt the need to write Love Wins. I remember reading these "comics" (there is really nothing funny about them) in the 70s. I didn't like them then but by today's standards they seem absolutely hateful. I pray that we have learned how to disagree respectfully and hear each other as we disagree. I'd find this funnier if I didn't know that many people believed in these ideas. Evolution is Math is Fun! A Response from the Minister of Fisheries!